The Shares tool allows you to perform three tasks: watch connections to your resources, view local open shares, and connect to remote resources over the network. When the program detects an external connection to your computer, it displays the information about the user as shown above. A new connection is also indicated by a sound alert and the tray icon color: the icon turns red. · Open Computer – attempts to open the selected computer. If the computer is accessible, a new Windows Explorer window listing remote resources will appear. You must have Client for Microsoft Networks installed to use this feature. · Copy IP Address – copies the selected computer's IP address to the clipboard. 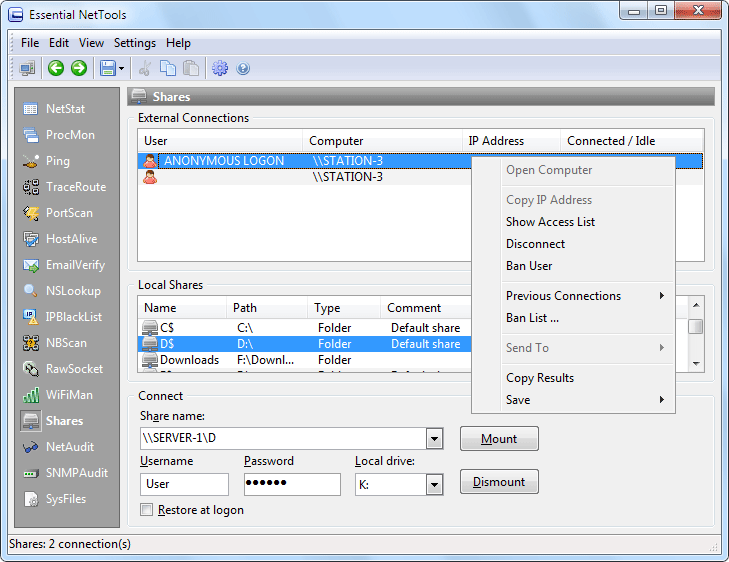 · Show Access List – brings up a window listing the local files accessed by the selected user. · Disconnect – disconnects the selected computer. · Ban User – adds the selected computer's name to the ban list. When a banned user tries to connect to your computer, he or she will be automatically disconnected. · Previous Connections – shows the log of previous connections and allows you to delete it. · Ban List – allows you to edit the ban list. · Send To – sends the selected IP address to other tools or to SmartWhois. · Copy Results – copies the connections table to the clipboard. · Save – saves the connections table to a file. Important: Disconnecting or even banning users cannot be considered a serious security measure. By disconnecting a user, you instruct the operating system to terminate the current connection, but the user can still re-connect in a few seconds. This can only slow down such connections. If you notice an unauthorized connection, it is recommended that you change the access policy by setting passwords for shared resources. This frame displays the list of shared resources on your computer. Finally, click on the Mount button to map a share to a local drive. Check the Restore at logon box if you want your computer to re-connect to the shared resource at the next logon. To un-map a resource, click on the Dismount button. Please note that the Dismount command will attempt to disconnect the drive specified in the Local Drive field, so if multiple resources have been connected, you should select the corresponding drive letter.